Gili Trawangan is one of the three Gili Islands situated off the north west of Lombok. All three islands have long white sandy beaches and clear turquoise water, fringed by coral reefs. These reefs attract abundant sea life and both Green and Hawksbill Turtles making the islands famous for diving. Gili Trawangan, the most popular of the Islands, has developed over the years and along with the laid back atmosphere now has quality hotels and restaurants, with a lively social scene and a vibrant nightlife. It is the combination of these traits that makes this island such a popular place to visit. Diving: Diving the Gili Islands is a year-round activity. There are many reputable dive centers based on Gili Trawangan. Look out for those that are members of GIDA (Gili Islands Dive Association) for the most professional, safe and experienced services. If you would like to avoid the crowds we can help you charter your own private boat therefore deciding your own departure time and schedule. Horse Riding: Horse riding can be arranged through the Stud Stables towards the southern end of Gili Trawangan. They have horses to suit all experiences levels and this is a great way to explore the Island especially to watch the sunset over Bali. Please ask Coconut Garden staff to arrange a booking. Trekking Mount Rinjani: Not for the faint hearted! This is a demanding 2-4 day trek climbing the second highest volcano (3,726 meters) in Indonesia. Once at the summit climbers are rewarded with some of the most amazing views of the volcano and crater lake. On a clear day you can see all the way to the Gili Islands and beyond. One piece of advice, make sure you have a sturdy pair of shoes and several layers of warm clothing as the summit can be very cold! There are several tour operators organising schedules to suit all levels of experience but if you need any advice please contact us or ask the staff at Coconut Garden. Yoga: This has become very popular on Gili Trawangan. 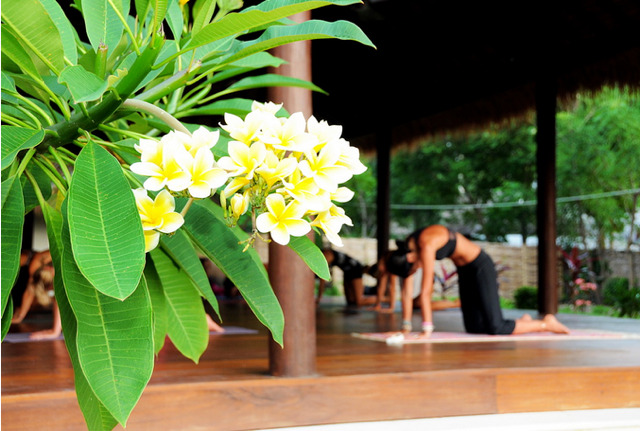 The highly experienced and professional centre, Gili Yoga is located a 10 minute bike ride from Coconut Gardens. Gili Yoga runs both morning and evening classes for all levels of experience.